Beach Grove Bridge No 98 is a minor waterways place minor waterways place place on the waterways major waterways place village town city on the Kennet and Avon Canal (Main Line) between Newbury Bridge No 60 (14 miles and 7¼ furlongs and 22 locks to the east) and Pewsey Wharf (Pump out available here (BW card)) (8 miles and 13 locks to the west). The nearest place in the direction of Newbury Bridge No 60 is Mill Bridge No 97; 3 furlongs away. 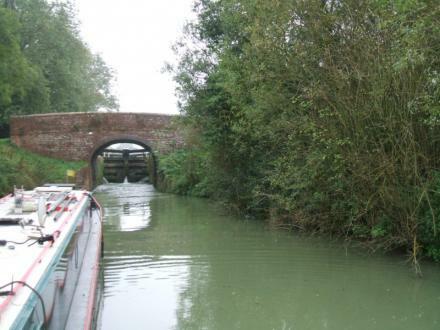 The nearest place in the direction of Pewsey Wharf is Crofton Bottom Lock No 63; a few yards away. 16 High St, Marlborough, SN8 3NU — 1629 yards to the northeast. 15 Fairfield, Marlborough, SN8 3PN — 1574 yards to the northeast. 48 Church Street, Marlborough, SN8 3PQ — 763 yards to the northeast. 6 Shawgrove, Marlborough, SN8 3UT — 1172 yards to the northeast. Great Bedwyn, SN8 — 1463 yards to the northeast. Crofton, nr Great Bedwyn, Marlborough — 1052 yards to the southwest. 90 Church Street, Marlborough, SN83PF — 1372 yards to the northeast. Elva Cottage, Great Bedwyn, SN9 6LU — 850 yards to the east. 45 Church St, Marlborough, SN8 3PQ — 842 yards to the northeast. Marlborough — 1540 yards to the southwest. Marlborough — 1072 yards to the northeast. Marlborough — 1090 yards to the northeast. Great Bedwyn — 1564 yards to the northeast. Crofton — 230 yards to the west. High Street, Great Bedwyn, SN8 3NU — 1626 yards to the northeast. Marlborough, SN8 1 — 1631 yards to the northeast. 10 Fairfield, Great Bedwyn, SN8 3PN — 1572 yards to the northeast. 160 Crofton, Marlborough, SN83DW — 529 yards to the southwest. Marlborough — 1533 yards to the southwest. Marlborough — 1463 yards to the northeast. 163 Crofton Road,Great Bedwyn, Marlborough, SN8 3LX — 248 yards to the southwest. 19 High St, Marlborough, SN8 3NU — 1605 yards to the northeast. Crofton Beam Engines, Marlborough, SN8 3DN — 1052 yards to the southwest. High street, Great Bedwyn, SN8 — 1576 yards to the northeast. 1509 yards to the southwest.